Curries Cottage01263 715779work01603 870304fax Self-cateringThis wonderful traditional flint and brick cottage shares a well-maintained rear garden and features modern utilities and a comfortable interior. 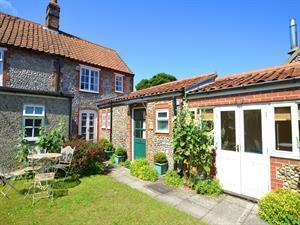 Great for families and groups, this property is a short walk from the beach. There is also a good selection of other walks, pubs and restaurants in the surrounding area. Guests can venture out into the ocean on a boat trip to observe the migratory birds and seals which make this quaint area of the Norfolk Coast so enviable. A traditional brick and flint fisherman's cottage, Curries Cottage is found at the end of the loke. Curries Cottage offers weekly bookings starting on Friday. This wonderful traditional flint and brick cottage shares a well-maintained rear garden and features modern utilities and a comfortable interior. Great for families and groups, this property is a short walk from the beach. There is also a good selection of other walks, pubs and restaurants in the surrounding area. Guests can venture out into the ocean on a boat trip to observe the migratory birds and seals which make this quaint area of the Norfolk Coast so enviable.